Few retellings invite more scrutiny from me than Beauty and the Beast, one of the most beloved fairy tales, so I was quite surprised at how much I enjoyed this. As retellings go, The Beast’s Heart by Leife Shallcross is pretty low-key, focusing on atmosphere and emotion instead of miring itself in attempts at audacious new twists. This makes it a somewhat slow and plodding tale, and while not all will have the patience for this, on my part I relished every moment. Told from the perspective of the Beast, our story begins in the enchanted forest where our protagonist lives with the curse cast upon him long ago. Slowly, painfully, he begins to remember the man he once was, but has no memory of why he was made into this beastly form, let alone how to break the curse. For many years he lives alone in his crumbling castle where the magic of the place seems to know his very heart, for it appears to cater to his every need. But even his invisible servants cannot help him with his one true desire, until one day, a lone traveler arrives at his door seeking rest and shelter. Allowed to stay the night, the traveler has dreams of his family as he slumbers. The Beast is able to see into them and is immediately drawn to the visions of the man’ s youngest daughter Isabeau, who had asked her father to bring her back a rose from his travels. As such, it is a rose that sets off the chain of events that leads to Isabeau to live with the Beast at his castle for one full year, though her father was also sent home with a treasure trove of gifts for his other daughters. For in this version of the tale, Isabeau has two older sisters, each dealing with their own private suffering at the loss of their youngest sibling who was the glue that held all of them together. Through letters delivered via an enchanted box as well as a magic mirror in the Beast’s chambers, readers are able to watch the family grow used to life without Isabeau, and in essence, we have two storylines: one following the Beast and Isabeau at the castle as he tries to win her heart to break the curse, and another less central one that focuses on the happenings back at Isabeau’s home with her Papa and sisters Claude and Marie. My favorite part of this book is hands down Shallcross’ depiction of the Beast. He is no monster, and over time it becomes clear that there’s not a malicious bone in his body. In fact, I wasn’t even sure why he was cursed in the first place (though later we do get some answers). Regardless, the Beast is most definitely a man, and it is his compassion and humanity that eventually wins Isabeau over. That said, I was impressed with how the author still managed to convey the animalistic nature of the character, even if it was less in the way of a snarling, savage beast and more in the way of, say, a big snuggly St. Bernard. Admittedly, there was also a lot about this image I found pitying. So many times the Beast reminded me of a lovesick puppy trailing after Isabeau, hoping she’ll return his affections while powerless to affect his own situation. In a way though, this classic tortured hero motif worked well, and didn’t feel too out of place in the context of a fairy tale retelling. I also enjoyed the parts we got to see of Isabeau’s sisters, because let’s face it—this book would have been terribly boring without them. This is not a fast-paced story to begin with, and there’s only so much you can show of the Beast and Isabeau’s daily routine before it becomes dull and repetitive, not to mention there are plenty of times where our protagonist is left alone to his own devices. Enter the magic mirror, in which he frequently checks up on how the rest of Isabeau’s family is doing. 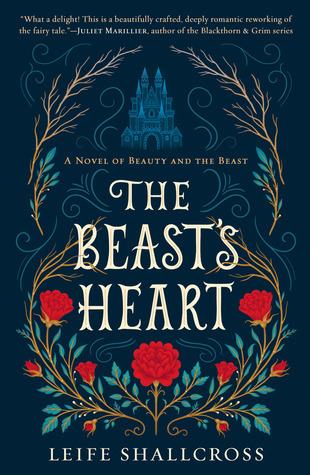 With fairy tale retellings being so common these days, I find it helpful when writing reviews to ask myself what makes one different and worth reading, and without a doubt, the answer for The Beast’s Heart is Claude and Marie. There’s a side story here involving the financial decline the family and the devasting effects it has had on all of them, and at the time of Isabeau’s departure, neither of her sisters were doing very well. Over time, however, we get to watch them pick themselves up and learn to be independent and flourish again, both in their personal ventures and in love. Unlike the original version of the Beauty and the Beast in which Beauty has elder sisters who are cruel and spoiled, Marie and Claude are sweet, sympathetic and care deeply about Isabeau. As such, both sisters’ individual stories were greatly endearing. As for the atmosphere, The Beast’s Heart also offers a nice change of pace. It is dark, but not oppressively so; moody, but not to the point of being melodramatic. In fact, I found the whole book to be quite charming and lovely. But like I said, this is not a fast-paced read, and without the sections involving Isabeau’s sisters, this story probably could have been a short story instead of full-length novel. As you’d expect, there a ton of exposition and detail, albeit all written beautifully. Every now and then I also got the feeling the author was trying for some deeper meaning about what it means to be human (with the Beast’s plight) or even a lesson on self-reliance (because it took Isabeau’s absence for Claude and Marie to find their own strength) but in truth, I didn’t think the story needed any messages to be enjoyable in its own right. All in all, The Beast’s Heart was a surprisingly good book, a passionately earnest and eloquent debut from Liefe Shallcross. A great read for lovers of quiet, evocative and lyrical fairy tale retellings, this interpretation told from the point-of-view of the Beast is well worth a look. I wonder how long this fairy-tale retelling thing is going to last. My only real exposure to it is from those who review them but it sure doesn’t seem to be slowing down. I wonder what an outsider’s perspective would be though. Would they have any idea this thing even exists? I imagine it’s going to go on for a while yet. In a way, I think the fairy tale trend has always been around, but these last two years it really exploded. I ended up being so glad Marie and Claude were included! This book would not have been the same without them! I thought it was! I actually liked that it was somewhat lowkey and didn’t do anything too crazy to the original B&tB. I love how you and Tammy both reviewed this on Valentine’s Day. How appropriate. The Beast is my favorite fairy tale (Beside Red Riding Hood). Is it surprising that my dog-loving nature as always been drawn to the Beast and the Wolf (who was just misunderstood 🙂 I love the snuggly St. Bernard reference – that was our Beast. And yes, the story desperately needed that magical mirror and side characters. I loved this book when I read it and your review made me love it all over again. Yeah, I thought this one would be perfect for Valentine’s Day! And yes, as a dog lover I really felt for the Beast because his behavior reminded me so much of a loyal, loving guardian pup! I was quite wondering about this one and the cover is so pretty! I should try as well! Changing what is usually the main focus of this story and shifting it to the Beast on one side and on Isabeau’s sisters on the other sounds like a good choice, because it must add new facets to a well-known fairy tale, saving it from being a “mere” retelling. Exactly! I think all retellings should add something new, and I liked that the author did it with the addition of Isabeau’s sisters’ stories rather than changing the original tale up too much. I really liked this one too – the beast wasn’t monstrous, and the pace was a bit ponderous but I just really enjoyed it – and, yes, it’s charming, and the sisters made a wonderful story that broke up the everyday repetition. Seeing your thoughts on this gives me really high hopes!